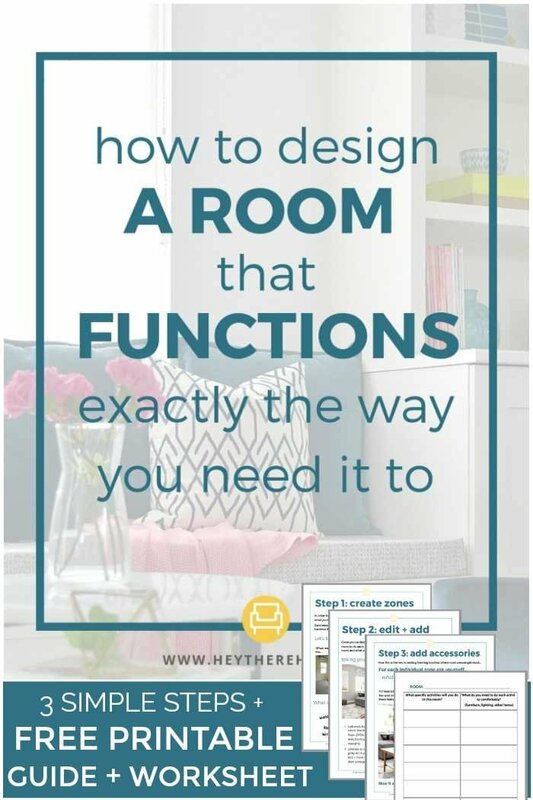 Inside: Follow these easy steps and download my free guide and worksheet to plan out a room that functions for your entire family and get ready to love your home in a whole new way! 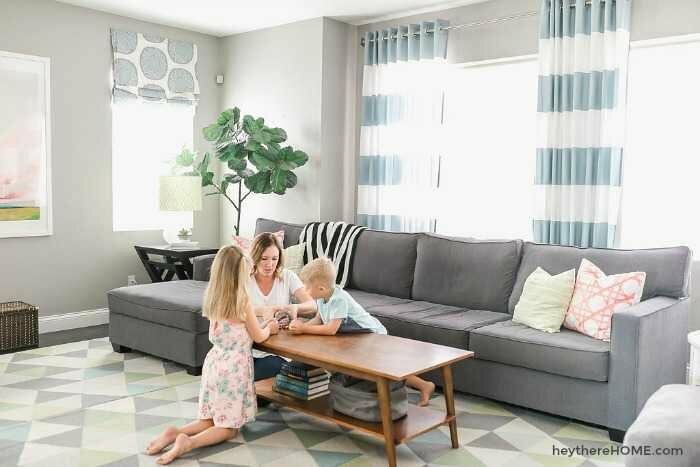 I think we can all agree that creating a home you love that works well for your family can be a bit overwhelming because there’s a whole lot of inspiration and ideas out there. How do you know what decor styles to include, trends to follow, or organizational systems to set up? Those are all great questions, and definitely ones that need to be well thought out, but one of the questions I get most actually comes way before you need to be thinking about your decorating style, or how you’ll organize your home. Before you can even begin thinking about style and the way things are going to look and feel, you’ve got to first think about the function of your space. Being very clear about how you want your space to function will ensure that you don’t waste money on furniture and decor that you don’t need. How do you design a room that functions exactly the way you need it to? Just because the original plans of your home included a formal dining room doesn’t mean you have to set that room up as one. Or if you love to bake but feel like you can’t do what you love very often because you’re kitchen isn’t very big, it might just be a matter of setting things up a bit differently to function the way you need it to. When you have what you need to do the things you enjoy doing and your space is set up to do them often, you’ve created a room that truly functions exactly how you need it to and your home serves your life well. 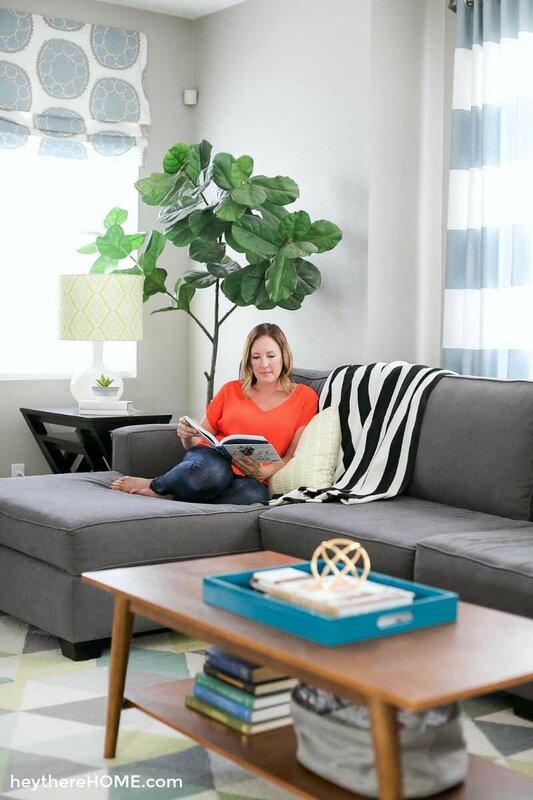 Today I’m going to walk you through just three easy steps to make sure that when you’re thinking about making changes to your space that the function of the space takes top priority. As you work through the three steps I’ll be walking you through, you’ll want to jot your ideas down and maybe even discuss them with your family members to make sure that everyone has a say in how each space in your home functions, which is why I created a simple guide and worksheet for you that you can download by clicking below. In order to even know what you need in a room you’ve got to first think about what you’ll do in that space. Each area of a room might be used for a different activity. Each of those areas within a room become a zone. Since we didn’t already have furniture to furnish this space, we needed to make sure that whatever we did buy was going to be money well spent. What activities will you do in the space? We first thought about what activities we would do in this space. — We were a growing family so we needed to think about what both adults and our kids would do in this space. List furniture and other items you need in order to do each activity comfortably. TIP! When you’re creating these lists really picture yourself doing the activity and write down every little thing you could possibly need. — Many of these things become the fun accessories in a room! Using my list of items for each activity I know exactly what I need to have in my room and since I know what I’ll be doing in each area I’ll have to make sure that anything I put in the room allows me to do those activities comfortably. I start by placing large pieces of furniture in each zone. So in my family room, I’ll need my sofa to face my TV, and have a table next to my sofa for my drink. For the large floor space I’ll want to keep a big enough area for play and exercise open which may dictate the size or shape of coffee table I put in the space. I’ll lay a rug down but won’t have it be too plush (cause I’ll be exercising on it) and I’ll want to have cabinets close by to store toys, games, and puzzles. Your list of items you need to do each activity should be so specific that you included accessories as well. The best styled homes don’t just have things displayed for the sake of filling a space. The accessories are often functional items and can fit your decor style to add to the style and feel of your home. I placed my sofa facing the TV and have a side table as my large furniture pieces but to put the finishing touches on the space and add to the functionality I include a light next to my sofa, coasters for my drink, a decorative box or tray for my remote controls, and toss pillows and a throw in fun prints to add color. Once you’ve planned out exactly what you need in your space you’ll realize that you not only have the large pieces you need and the layout set up in a way that creates different areas for different purposes, but you’ll have also included a list of accessories that you need to include in your space. These functional accessories are a great way to add in elements of your styles and not end up with just a bunch of stuff in a room that doesn’t serve a purpose. Now that you know what you need in your space, it’s just a matter of consulting your decor plan to know what colors, materials, and styles each piece you have in a space should be. If you need guidance really understanding your decorating style and creating a whole home decor plan, you’ll want to check out the details about my course, Style Your Way Home on this page. That’s hard to achieve, specially since I keep changing my mind for what I want the room to be, lol. Tips are awesome, tho. So many have that trouble, Diana. I did too until I learned how to discover and define my style — and it really works! Learn how by reading this post! This is very helpful..Thank you for the insightful tips!